Welcome to another blog tour with the Creation Station design team – we’re glad to have you join us! Summer is in full swing now, so we thought we’d celebrate with everything blooming! That’s right – it’s all about the flowers this time, so you’ll see lots of beauty in this blog tour. Our feature stamp sets will be Flower Patch and Flower Shop, with some bonus watercolouring and/or colouring using Blender Pens thrown in for good artistic measure! All of the participating blogs are linked together in a circle, so as long as you keep clicking on the ‘Next’ or ‘Back’ button (in one direction), you’ll be taken through all of the blogs, and you’ll see all the great creations made just for your viewing. There’s only 5 of us this tour (summer schedules, you know! ), but you’ll enjoy every moment 🙂 If you’ve been traveling forward, you’ll have just come from the amazing creations of Sara Levin – I just love her work! 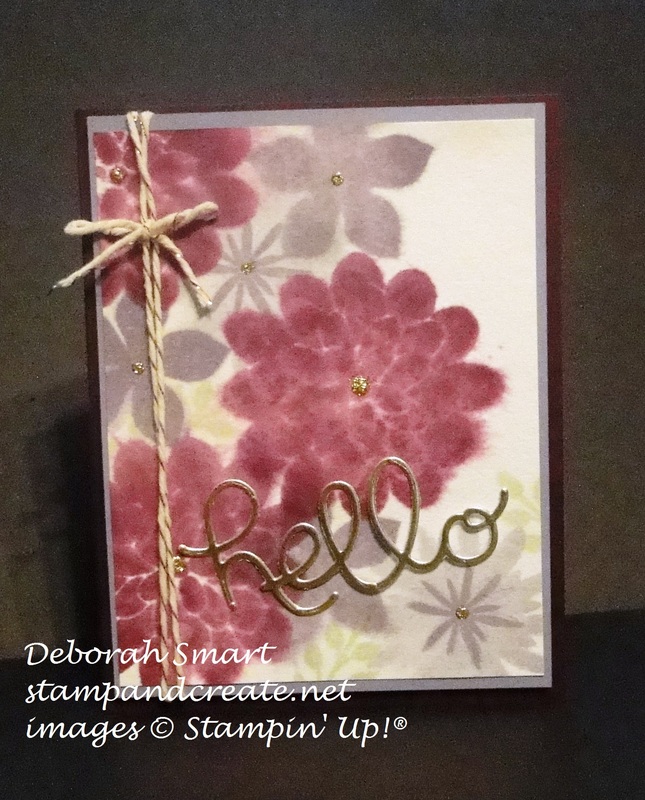 To start, I decided to combine stamping with water, and the Flower Patch stamp set. I started by using a Stampin’ Spritzer to spray a panel of Watercolour Paper with water. I then inked up the largest stamp from the Flower Patch stamp set in Blackberry Bliss ink, lightly spritzed the stamp with water, then stamped onto the damp Watercolour Paper. I repeated this using the different flower images and the ink colours in Blackberry Bliss, Perfect Plum and Wisteria Wonder. The leaves were stamped the same way, using Pear Pizzazz ink. This is a fun technique to play with; you get different looks depending on how wet you have your paper and/or stamp. After the paper had dried, I applied a dot of Dazzling Details in Gold in the centre of the flowers. The ‘hello’ was die cut using the Big Shot and the Hello You Thinlits Dies, and cut from Gold Foil Sheets. I used Tombow Multipurpose Glue to attached the stamped panel to a panel of Wisteria Wonder cardstock, the wrapped some Gold Baker’s Twine around the two pieces. I then attached the whole thing to a card base of Blackberry Bliss cardstock. I had fun making this next card with the fancy fold technique called shadow box card. This fold is fun to do, and easy, too! You start with 2 pieces – I used Very Vanilla cardstock for the back piece, and Bohemian Designer Series Paper for the front; both 4 1/4″ x 5 1/2″, scored on each end at 1/2″ and 1″. I used the new Tags & Labels Framelits to create the opening in the centre of the Bohemian DSP, as well as to create the frame around the opening made with Bermuda Bay cardstock. It’s important to do all your stamping and decorating before attaching the 2 pieces, so that your card shape doesn’t get flattened! After creating the opening in the front of the card, I stamped the sentiment onto the back piece, using Bermuda Bay ink and the sentiment from the Thoughts and Prayers stamp set. I wanted to add some embellishments to the inside of the card, so I added 3 flowers from the Petite Petals set, stamped in Crushed Curry and Bermuda Bay, and cut out using the matching Petite Petals Punch. On the outside of the card, I wanted to add some flowers around the frame, so I stamped the larger flower using Crushed Curry ink and the Flower Shop stamp set, and cut it out using the coordinating Pansy Punch. I then stamped 3 more flowers using the Petite Petals stamp and Bermuda Bay, Crushed Curry and Blackberry Bliss inks (which are the coordinating colours in the DSP), and used the Petite Petals Punch to cut them out. 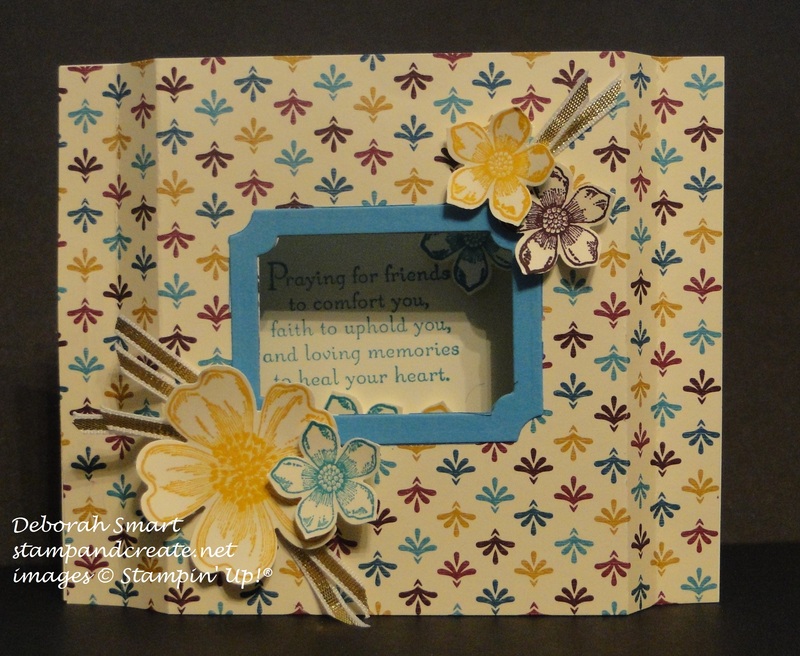 I added them around the frame using Stampin’ Dimensionals, then added some 1/8″ Ribbon in Gold behind the flowers. A fairly easy card to create, but it can be a ‘wow’ because of the unique design. 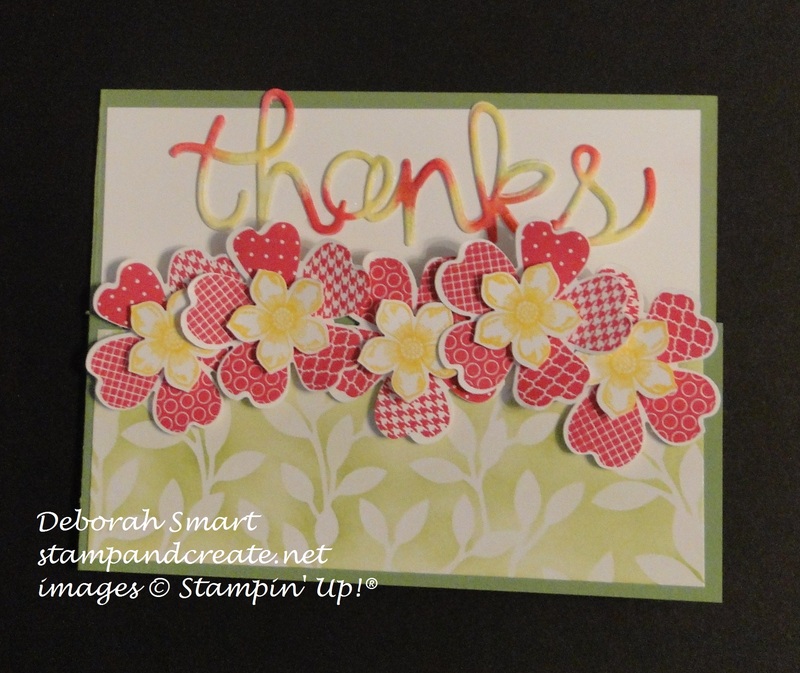 For my last card, I had fun again using the Flower Shop and Petite Petals stamp sets, and the Hello You Thinlits Dies. For this card, I started with a card base of 4 1/4″ x 11″, scored in half at 5 1/2″. I then cut 2″ off of the top of the front panel, so that you can see the top of the back panel. I stamped 5 flowers in Melon Mambo ink using the Flower Shop stamp set and the Pansy Punch for cutting them out, then layered a Daffodil Delight flower from the Petite Petals stamp set (cut out using the matching Petite Petals Punch) in the centre. After gluing the coloured Irresistibly Yours paper to the front, I attached the flowers with Stampin’ Dimensionals, so that they are attached to the front, and layer up over part of the back panel. I created the sentiment using the Hello You Thinlits; I die cut the ‘thanks’ twice from Whisper White cardstock, and layered the 2 together for more dimension. I then used Sponge Daubers and Melon Mambo, Daffodil Delight and Pear Pizzazz ink to add some colour to the letters, so that they would stand out better on the Whisper White panel I attached to the inside back of the card. Those are my projects for this blog tour – I hope you enjoyed seeing them, and got some creative ideas! If you have time to leave a comment, I’d love to hear from you! Now you can either head back to have another look at Sara’s projects – they were great, weren’t they?! 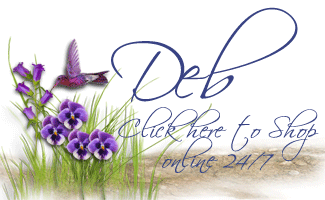 Or you can click on the ‘next’ button, and start back at the beginning of the tour at Jennifer Downey’s blog. If you’d like to purchase any of the supplies I used in my projects, simply click on the image(s) below, and you’ll be taken directly to my online store, where you can place your order. Previous Previous post: Happy July 4th! Love all 3! My favorite is how you sponged color on the “thanks”. Haven’t gone that yet and need to give it a try!